Fans recently learned that Gnome Press co-publisher Martin Greenberg died in Medford, NY on October 20, 2013. He and Dave Kyle co-founded Gnome Press in 1948. Together they published dozens of volumes of classic sf in hardcover for the first time. According to the Science Fiction Encyclopedia Greenberg edited seven anthologies for Gnome, of which Coming Attractions (1957) consisted of SF-related nonfiction articles. 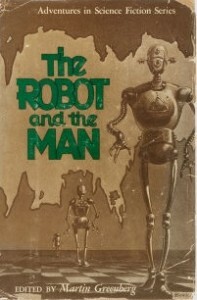 The others were Men Against the Stars (1950), Travelers of Space (1951), Journey to Infinity (1951), Five Science Fiction Novels (1952), The Robot and the Man (1953) and All About the Future (1955). Gnome Press went under in 1962. Andrew Porter recalls that after years away from the sf community Greenberg, then living on Long Island, returned to attend some SF conventions in the 1990s. This entry was posted in In Passing and tagged Dave Kyle, Gnome Press, Martin Greenberg by Mike Glyer. Bookmark the permalink. I have one Gnome Press book in my collection, “The Mixed Men” by A.E. van Vogt. Just looking at it evokes a time when science fiction books were scarce, and publishing them was, in many cases, a labor of love. R.I.P., Martin Greenberg.